Sepp Blatter’s house of cards is finally tumbling to the ground. After facing down allegation after allegation of corruption in football’s governing body, FIFA’s chief has been brought down, it seems, by a U.S. investigation that has honed in on several senior figures in his organisation. Rarely has an American-sponsored regime change drawn such praise from across Europe’s political spectrum. Figures from the wealthier footballing nations are already demanding the replacement of the supposedly venal hierarchy of the sport’s governing body with men of their own ilk. It was perhaps fitting, then, that the indictments that led to Blatter’s downfall were issued in New York: a city with a long history of pitting bosses against reformers. Blatter’s power, as a short piece on FIFA governance in a 2006 New Yorker article noted, owed much to his ‘Boss Tweed-style tactics.’ The comparison, which might not mean a lot to readers in the U.K., is worth pursuing. William M. Tweed, portrayed by Jim Broadbent in the 2002 Martin Scorcese film Gangs of New York, headed Manhattan’s Civil War-era Tammany Hall: a vote-getting Democratic Party ‘machine.’ Though never holding high office himself, he acquired immense influence through cleverly dispensing the patronage that came with control of a complex but sizeable municipal government. In the years before a professional civil service, just about every public job in the city – from sweeping to policing the streets – was (directly or indirectly) a political appointment. The constant rounds of elections were usually followed by long queues of ‘officeseekers’ expecting rewards from the candidates they’d backed. Contractors prospered from their connections to politicians; to the victors went the spoils. Tweed played the patronage game with silky skill and before long candidates for office had little chance of success in the city without Tammany backing. 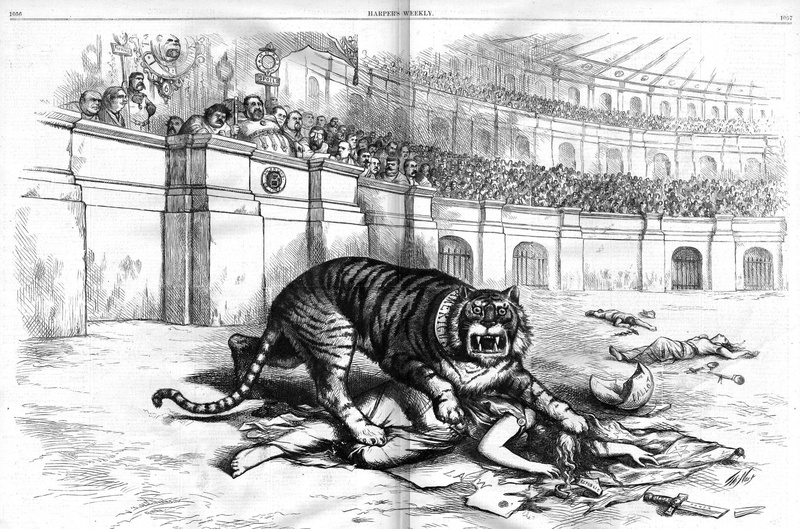 At its peak his power seemed of imperial proportions: the disgusted cartoonist Thomas Nast portrayed the boss as a Roman Emperor watching from a perch in the Coliseum as a tiger devoured Lady Liberty. But Tweed’s world came crashing down in the early 1870s when wealthy New Yorkers, egged on by the likes of Nast and the New York Times, had him locked up. After several criminal and civil suits – not to mention a brief flight to Spain – he died in jail in 1878. Some reformers estimated that he had blown $200m of the city’s finances: a hefty $3bn in today’s money. For years historians told the story of reformers’ victory over Tweed as a morality tale: good had triumphed over evil. Much of the reporting of the FIFA scandal fits a similar narrative. Yet by the middle of the twentieth-century Tweed’s reputation – along with those of other urban bosses – began to rise. Historians noted the real support Tweed’s ‘ring’ enjoyed among New York’s marginalised white working-class, for whom patronage – in the absence of a bureaucratic welfare state – could make the difference between food on the table and alms in the poor house. Manhattan’s immigrant voters, it seemed, were not the ignorant dupes of reformist myth-making, but were instead citizens well aware that a corrupt spendthrift government had more to offer than any pure but parsimonious alternative. But the support Tweed enjoyed from many wealthy New Yorkers indicates he was no Robin Hood. Tammany’s dubious ties to businessmen and creative accounting enabled the city to expand uptown in rapid strides, created jobs, and helped to maintain (for a while at least) social peace in a city ravaged by riot and disorder. New York remained a place of immense inequality – a mixture of sunshine and shadow, as commentators at the time liked to put it – but by spreading the wealth while stimulating urban development Tweed may have narrowed the gap between the ‘upper tenth’ and ‘lower million’. Certainly he did so more effectively (if at far greater expense) than the reformers who came into power after 1871, who baulked at the city’s burgeoning debt, and proclaimed an age of austerity. The struggle over FIFA today replays the drama on a global stage of earlier municipal battles between bosses and reformers. Wealthy nations demanding the sweeping of football’s Augean Stables bear more than a passing resemblance to Manhattan’s ‘bourgeoisie’ who saw control of the city slipping from their hands. Blatter loyalists – largely from developing countries – laud him as a friend to the poorer parts of the globe. Whatever sins FIFA’s latter-day Tammany Hall may have committed, some might say it’s done a better job than its English FA critics at distributing the vast income from TV rights to the grassroots. Meanwhile, Blatter’s growth regime has taken football into new markets in Africa and Asia, an advance comparable to Tweed’s ‘uptown march’ in New York. As in Gilded Age Manhattan, the human cost of expansion is horrifying – the reports of the death toll at Qatar’s new stadia ought to inspire far greater indignation than any allegations of malfeasance – and if American investigators are proved right then vast sums of money have disappeared in the process. But corruption, as a crusading journalist in one turn of the century American city put it, can lead to contentment, and not just for those with their hands in the till. Boss rule in the U.S. never really went away and, despite Blatter’s resignation, it’s unlikely to disappear at FIFA. The professionalization of the civil service, the strengthening of legal sanctions, and the decline of popular politics slowly sapped the strength of Tweed’s heirs. Even today, though, a politician who does not know how to play the patronage game is unlikely to get far. Figures in the mould of Tweed may be hard to like – they keep unsavoury company and can seem less than savoury themselves – but the power they accrue is not simply a result of their mastery of political dark arts. It may also owe something to their ability to spread (as well as skim) the profits. There’s some great work on Tweed’s New York. Three of my favourite books are Iver Bernstein, The New York City Draft Riots: Their Significance for American Society and Politics in the Age of the Civil War (Oxford, 1990); Sven Beckert, The Monied Metropolis: New York City and the Consolidation of the American Bourgeoisie, 1850-1896 (Cambridge, 2001); and David M. Scobey, Empire City: The Making and Meaning of the New York City Landscape (Philadelphia, 2002). Though it’s a bit dated now, Seymour J. Mandelbaum, Boss Tweed’s New York (New York, 1965) began to get at the complexity of Tammany’s metropolis. The term ‘Boss’ has its critics among American urban historians, who have sometimes suggested ‘ring’ – a term contemporaries used to refer to closely-allied politicians – as an alternative. Few so-called bosses were as powerful as reformers suggested, but in Tweed’s case at least, the term is a useful one. Andrew Heath is Lecturer in American History at the University of Sheffield, specialising in the Civil War-era United States. You can see Andrew’s other History Matters blogs here, and find him on twitter@andrewdheath. He is also a supporter of new-promoted Bristol City.